Donald Trump’s "National Diversity Coalition" adviser Dr. Lisa Shin heralded her parents’ story of immigrating to the United States, slammed Hillary Clinton as a threat and pointed to Donald Trump as preserver of the American Dream. “Over 40 years ago, my parents left South Korea to come to America.” said Shin. "They knew America was the land of opportunity and freedom, where immigrants could succeed and prosper. So they swore an oath to support and defend the Constitution." She continued “There is only one presidential candidate who will preserve the American dream that our parents and our grandparents envisioned for us.” she added. "that candidate is Donald J. Trump." 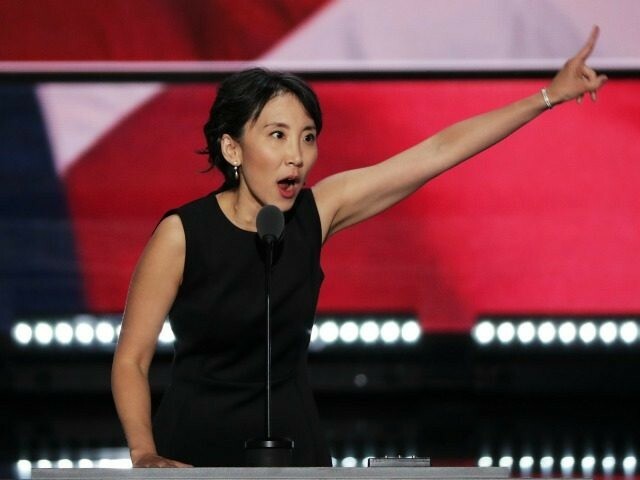 CLEVELAND, Ohio — Donald Trump’s National Diversity Coalition adviser Dr. Lisa Shin heralded her parents’ story of immigrating to the United States, slammed Hillary Clinton as a threat to and pointed to Donald Trump as preserver of the American Dream. Owner of Los Alamos Family Eyecare, Dr. Shin announced herself as a national delegate from New Mexico, a Chrisitan, wife and mother. They knew that America was an exceptional and generous country where immigrants could become American citizens, participate in American democracy, and live the American dream. They knew America was the land of opportunity and freedom, where immigrants could succeed and prosper. So they swore an oath to support and defend the Constitution. “Hillary Clinton is a direct threat to the American Dream,” she added. With contempt, she has flouted the rule of law that we rely on for justice, order, and peace. She has overwhelmingly lost the trust of the American people. She is not qualified to be our next president. She is unfit to be the commander in chief of the brave men and women who sacrifice so much to fight for our country. There is only one presidential candidate who will preserve the American dream that our parents and our grandparents envisioned for us. There is only one candidate who will ensure a more prosperous, safe, and secure future for our children and our grandchildren. There is only one candidate who will defend the core principles that this great country was founded upon. There is only one candidate who will protect, stand with and fight for we, the American people. There is only clear choice for America: that choice is Donald J. Trump.